Are there any product images for publish? You can download our product images from below link. Is there a products catalogue? You can download our products catalogue from below link. Where can I purchase items from? We have many dealers all over the world. Please order our products to them. Are these products dust and drip proof? Are there any examples of usage of the lens? You can find examples by clicking the link below. What cameras can I use with the lens? There’s a lens for Micro Four Thirds mount and E mount. The lens for micro four thirds can be used on cameras with Micro four Thirds standard such as Olympus’ and Panasonic’s cameras. For details, please take a look at the website of Micro Four Thirds. The lens for E mount can be used with Sony’s αseries camera. *By using the size APS-C, the fisheye lens circumference will be fit beautifully so please use the APS-C mode of a7 series for shooting. Which lens is suitable for using circumference fish eye lens? It depends on cameras what you use. There are 3 image circle sizes for Entaniya Fisheye 250 MFT. If you use the lens as a circumference fish eye lens, the ways to make image circle fit perfectly are as below. Is the aperture fixed? Can it be changed? The aperture of Entaniya Fisheye 250 MFT has been fixed but since there’s a pocket for installing ND filter in the bottom of the lens, the aperture can be adjusted for better suitability for shooting in bright places. The aperture can also be changed by using the rear group kit. Can I change the lens mount myself? Yes, you can change the lens mount yourself, if you purchase other mount type lens base. Please check below video and manual. Is the lens a conversion lens? No, Entaniya Fisheye 250 MFT is not a conversion lens. Can I use the lens with Sony a7 series? Entaniya Fisheye 250 MFT is designed so that its circumference fits exactly with the size of APS-C sensor. When shooting with full size sensor, you must use the APS-C mode. Can the image circle size be changed? By using the rear group kit, it’s possible to change the image circle by exchanging the rear group lens. Is there parameters for PTGui and Autopano? You can download the parameters from the link below. There are also pictures taken with matched NPP so it’s possible to create a parameter file by yourself as well. Have the image height and MTF graph been released already? Yes, you can find the information by clicking the link below. Is there any sample pictures? Yes, you can find sample photo by clicking the link below. By the way, in order to make the fish eye lens’s circumference image circle to fit exactly, you should use Entaniya Fisheye 250 MFT 3.0 on Micro Four Thirds and Entaniya Fisheye 250 MFT 3.6 with APS-C sizes. Yes, you can fined the information by clicking the link below. Do you have any samples on shooting video footage? Yes,Yes, you can find sample photo by clicking the link below. The ordinary 360VR is shot using many cameras. However, the bigger the number of cameras, the more demanding will it be to stitch the pictures together. In situations like shooting VR from a moving vehicle where it’s not necessary to get full 360°, you can lower the production costs and make VR more efficiently by using only one camera for making VR footage. You can make One-Shot VR using a fish eye lens with an angle of view of 180° as well but there’s a problem of the field of view getting narrow. If you use Entaniya Fisheye 250 MFT for shooting, there’s a field of view of 250° which is wide enough. 250° is approximately the same field of view a normal person can see when looking left and right without moving one’s shoulders. One-Shot VR is extremely suitable in situations like concerts or sports where the main subject is always in front of the photographer or in situations where the photographer is shooting from a moving vehicle. The objects behind the photographer will be black with no footage but this space can used effectively by inserting captions, patches or advertisements. Is there any difference in the image quality between MFT and an ordinary 360VR Kit? Yes, you can check the differences by clicking the link below. Is there any software or plugin for developing VR video footage? You can develop VR video footage by 360VR video stitching software called Autopano Video or by using a plugin for Adobe After Effects called LE:Lens. How to create 360VR in the car? Here is the article that how to create 360VR in the car with Entaniya Fisheye 250. Is there sample footages to know differences of cameras? The most suitable camera for creating 360 VR will depend on the application and required quality. I think that the standard will be Sony α 7 Rii or α 7 Sii, or Sony a 6500, Panasonic GH 4 or GH 5, Blackmagic micro studio camera 4K. 360VR resolution is dpends on camera and lenses what you use. 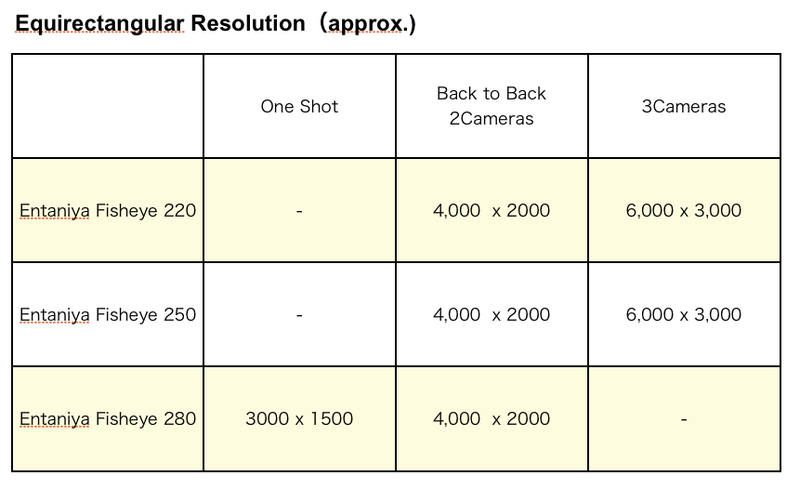 Here is the criterion resolution list. Are there any 360VR footages of 250 MFT for stitch test? You can download original footages from below page. How to change the aperture? What kind of cameras can I the lenses on? Entaniya Fisheye was developed for 1/2.3 sensors. The cameras that use the sensor are action camera such as GoPro. You can check the video that how to attach the lens those cameras. Are there Entaniya Fisheye Parameters for PTGui? You can download Entaniya Fisheye Parameters for PTGui from below link. Are there Entaniya Fisheye Parameters for Autopano Video? You can download Entaniya Fisheye Parameters for Autopano Video from below link. Can I attach the lens to GoPro HERO 4 Black? Entaniya Fisheye lens is designated for cameras with mount size of M12/P0.5 and sensor size of 1/2.3-1/1.7. What’s the difference between using 3Cam rig complete set’s Back Bone Ribcage and just installing the lens directly to GoPro? 3 cam rig complete set for 220 Back Bone Ribcage is called Back. It uses a GoPro remodeling kit. – The set for Back Bone Ribcage can be used with Back to Back rig for 2 cameras, allowing the use of a set of 2 cameras together. How much resolution can I get when I shoot with 360 VR Kit? The size of equirectangular resolution, when you shoot with Back to Back Rig or 3 Cameras Rig using Entaniya Fisheye lens. How to set the camera mode when I shot with 360VR Kit? These are recommend settings when you attach the Entaniya lens on GoPro. How to set the camera mode with Entaniya Fisneye 280? There are some difference setting test with Entaniya Fisheye. 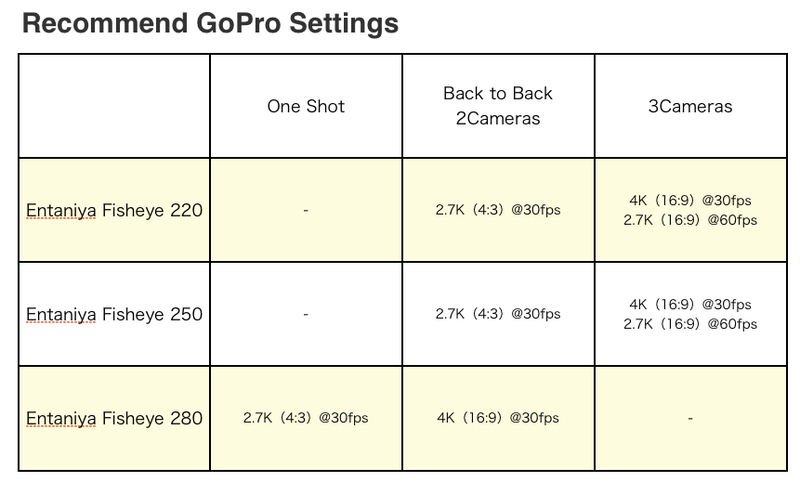 Differences of spot meter settings when shooting with GoPro with Entaniya Fisheye 280°attached. Are there sample footages before stitch? You can download original footages that was shot with 360VR kit from below link. Yes, it is third-party’s product. The water housing is for 3 modified GoPro with Entaniya Fisheye 220. What kind of software should I use for 360VR? Famous 360VR software is Autopano Giga and Autopano. Autopano Video 2.3 has stitching parameter for Entaniya Fisheye soo stitching work can be easily done. You can purchase from their online store. How to create 360VR video with 2 Cameras Complete Kit 280 Z280K? How to create the 360 Video with 2 Cameras Complete Kit 280 Z280K （280 Back-to-Back） with Entaniya Fisheye. How to create 360VR video with 2 Cameras Complete Kit 220 Z220K? How to create the 360 Video with 2 Cameras Complete Kit 220 Z220K （220 Back-to-Back） with Entaniya Fisheye. How can I create VR video from one footage file with Autopano Video Pro? You can create VR video from one footage file with Autopano Video Pro. Please check the below article. Method of developing one footage file that’s shot with Entaniya Fisheye 280° to 360° VR video with Autopano Video Pro. How to stitch footages with Autopano Video? Here we introduce method for creating 360° video with Autopano Video Pro (Kolor co.) from footage shot by Back to back with Entaniya Fisheye lens attached. How to publish 360 ° VR videos on YouTube? You can publish 360VR Video on Youtube. Can I create VR video with a Entaniya Fisheye 280? Yes you can create it. Focus problem that out of focus in one side. If you have a focus problem that out of focus in one side. It might be not parallel with lens and sensor. How to adjust image circle position on the center? After using camera+lens set which uses modified GoPro kit’s Back-Bone Ribcage for some time, you might start noticing some problems. In case you have the problem of stitching not going well, or any other problems, you should check whether the position of image circle is right or not. Normally the image circle should be in the center of the screen. However, something some part of lens shifts out of its position or something else happens and the image circle gets dislocated from the center. Method of adjusting image circle position of camera+lens set. How to fix the focus? It’s not too difficult to focus on with Entaniya Fisheye camera+lens set but you ought to know a few trick. Method of fixing the focus of the camera+lens set. Copyright© Entaniya Fisheye Support blog , 2017 All Rights Reserved.